Recent headlines that chocolate supplies could fall short of demand by as much as a million tonnes by 2020 have been alarming. 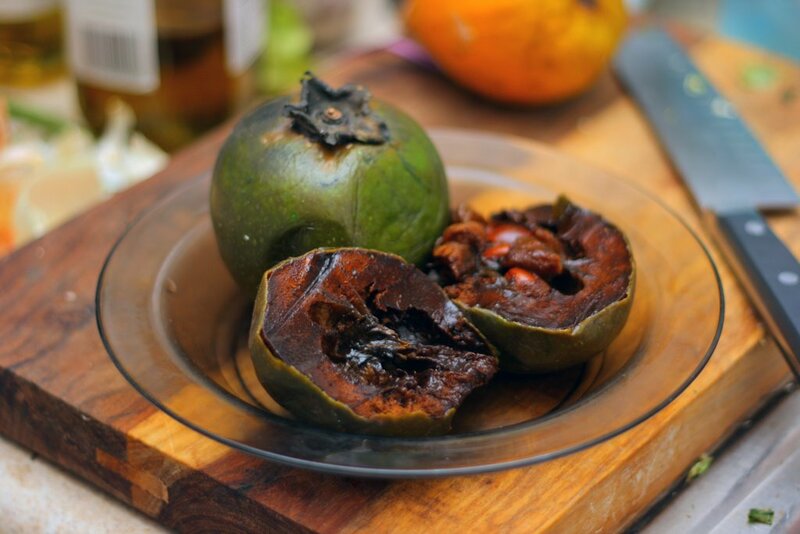 Those in despair over the news can take heart, however, as substitutes are available to get you through the rough times, including one that is actually relatively healthy – black sapote. Native to the coastal regions in and around Central America, black sapote is a fruit, related to the persimmon, and it is today cultivated primarily across the Caribbean, as well as in Mexico, Australia and the Philippines. On the tree, the fruit sort-of resembles a green tomato when ready for picking. And it is extremely important that you don’t try to pick it too early or eat it right off the tree. Unripe black sapotes not only don’t taste like chocolate, but are quite gag-worthy. Further, if it’s picked too early, the fruit won’t ever ripen and will simply rot, which one imagines doesn’t improve the flavor over the non-rotted, unripe version. The pulp can be eaten as is (but not the skin), but given that it tastes a lot like chocolate pudding, it’s also commonly used in various recipes as a substitute for chocolate. If you’ve ever wondered what the “M’s” stand for in one of the world’s favorite chocolate-based candies, M&Ms, wonder no more. In 1941, Forrest Mars Sr., of the Mars candy company, struck a deal with Bruce Murrie, son of famed Hershey president William Murrie, to develop a hard shelled candy with chocolate at the center. Mars needed Hershey’s chocolate because he anticipated there would be a chocolate shortage in the pending war, which turned out to be correct. As such, the deal gave Murrie a 20% stake in the newly developed M&M; this stake was later bought out by Mars when chocolate rationing ended at the end of the war, in 1948. The name thus stood for “Mars & Murrie” the co-creators of the candy. The color orange was named after the fruit, not the other way around. Before then, the English speaking world referred to the orange color as geoluhread, which literally translates to “yellow-red.” The word orange itself was introduced to English through the Spanish word “naranja,” which came from the Sanskrit word nāraṅga, which literally means “orange tree.” The English dropped the leading “n” and eventually we got the word “orange.” In the early 16th century, the word orange gradually started being used to not only refer to the fruit, but also what we now know of as the color orange. In High School, Major League Baseball star pitcher Justin Verlander traded a small percentage of his eventual $3.12 million signing bonus for a 50 cent chocolate milk. This happened while the future MLB superstar was in the 10th grade at Goochland High School in Virginia. Short 50 cents needed for a chocolate milk that day, he asked his friend Daniel Hicks for the money. “So I said, ‘How about I give you 0.01% [actually it was .001%] of my pro signing bonus if you give me 50 cents now?’ He found a napkin, wrote it up, and I signed it. I forgot about it, but after I signed [with Detroit], he comes over and whips out this old napkin. I’m like, oh my God! My bonus was 3-point-something million.” That worked out to a little over $3K for the industrious Daniel Hicks who turned 50 cents into $3120 in just about five years, when Verlander signed with Detroit in 2004 out of college for a guaranteed contract of $4.5 million (max $5.6 million) with a signing bonus of $3.12 million.